This week’s #RenFrowBackThursday is about the two men without whom Renfrow would even exist anymore!! 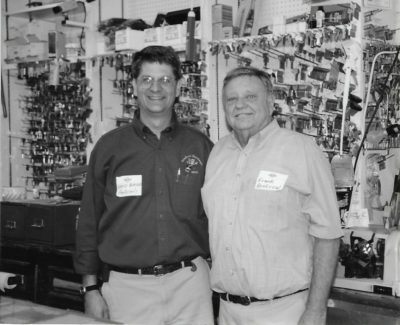 Renfrow Hardware business partners David Blackley and Frank Renfrow enjoyed co-hosting the store’s 100th anniversary celebration in 2000. (David looks so young!) Frank’s grandfather, Thomas Jefferson “Captain” Renfrow started the store in 1900. David and Frank were business partners for 25ish years before Frank passed away in 2010. It is all thanks to Frank that we were able to expand into the farming business on his home property in downtown, which he left to the hardware store at his passing. Our land was a farm back in the late 1800s/early 1900s and we love that we are able to keep this little bit of history alive – many of the main homes in Matthews at the beginning had large gardens on their property. There are still plenty of gardens tucked away in many downtown residents’ yards, but the homestead era is over – even I don’t have pigs living behind my house! The farm was one of David’s many visions for diversifying the hardware business and adding assets to the town of Matthews. We are so thankful to continue operating this family business steeped in Matthews history.